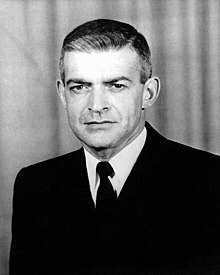 Vincent Robert Capodanno (February 13, 1929 – September 4, 1967) was a Roman Catholic priest who was killed in action in 1967 while serving as a United States Navy chaplain assigned to a Marine Corps infantry unit during the Vietnam War. He was a posthumous recipient of America's highest military decoration — the Medal of Honor — for heroic actions above and beyond the call of duty. Vincent R. Capodanno was born on Staten Island, New York, on February 13, 1929. He was the tenth child of Italian immigrants. He graduated from Curtis High School, Staten Island on February 4, 1947, and attended Fordham University for a year. In 1949, he entered the Maryknoll Missionary Seminary in Ossining, New York. He was ordained a Roman Catholic priest on June 14, 1958. Father Capodanno's first assignment was in 1959 as a missionary was with aboriginal Taiwanese in the mountains of Taiwan where he served in a parish and later in a school. After seven years, Father Capodanno returned to the United States for leave and then was assigned to a Maryknoll school in Hong Kong. On December 28, 1965, Father Capodanno received his commission as a lieutenant in the Navy Chaplain Corps. He then requested to serve with the Fleet Marine Force (FMF), in Vietnam. After some training to serve within the Marine Corps, he was assigned to the 1st Battalion, 7th Marines, First Marine Division in South Vietnam, in April 1966. In December, he was transferred to the 1st Medical Battalion, 1st Marine Division until his year's tour was completed, and then extended for another tour of duty in South Vietnam. In June 1967, he arrived in Vietnam, and in July was assigned 1st Battalion, 5th Marines. In August, he was assigned to H&S Company, 3rd Battalion, 5th Marines, 1st Marine Division, in Vietnam. On September 4, 1967, at 4:30 am, during Operation Swift in the Thang Binh District of the Que Son Valley, elements of the 1st Battalion 5th Marines encountered a large North Vietnamese Army (NVA) unit of approximately 2,500 men near the village of Dong Son. The outnumbered and disorganized Company D of the 1st Battalion was in need of reinforcements. By 9:14 am, 26 Marines were confirmed dead, and two rifle companies from the 3rd Battalion, 5th Marines was committed to the battle. At 9:25 am, the commander of 1st Battalion, 5th Marine requested further reinforcements. When he heard that two platoons of M Company from his battalion was taking casualties and about to be overrun by the enemy, Father Capodanno went among the wounded and dying Marines of Second Platoon, helping them and giving last rites. He was wounded in the hand, arms, and legs. Refusing medical aid, he went to help a seriously wounded Navy corpsman and two wounded Marines only yards from an enemy machine gun and was killed; 15 Marines and 2 corpsmen also were killed. His body was recovered and interred in his family's plot in Saint Peters Cemetery, West New Brighton, Staten Island, New York. On December 27, 1968, Secretary of the Navy Paul Ignatius notified the Capodanno family that Lieutenant Capodanno would posthumously be awarded the Medal of Honor in recognition of his selfless sacrifice. The official ceremony was held January 7, 1969. On May 19, 2002, Capodanno's Cause for Canonization was officially opened. In May 2004, the initial documentation was submitted to the Congregation for the Causes of Saints, with CatholicMil (later renamed Mission Capodanno) acting as Petitioner and Father Daniel Mode named Postulator. On May 21, 2006, Capodanno's official designation as a Servant of God was announced in Washington D.C., by Archbishop Edwin F. O'Brien of the Archdiocese for the Military Services, USA. On October 1, 2013, Archbishop Timothy P. Broglio presided over the formal renewal of the opening of the Cause for Beatification of Father Capodanno. Broglio announced at this time that the newly established Capodanno Guild would serve as the Petitioner of the Cause, and Andrea Ambrosi as Roman Postulator. In 2017, for the 50th anniversary of Capodanno's death, EWTN collaborated with the Guild to produce Called and Chosen, a documentary film publicizing Capodanno's life and the ongoing canonization effort. The film won the Catholic Press Association's Gabriel Award for Best Religious TV, National Release. Medal of Honor Bronze Star Medal w/ Combat "V"
For conspicuous gallantry and intrepidity at the risk of his life above and beyond the call of duty as Chaplain of the 3d Battalion, in connection with operations against enemy forces. In response to reports that the 2d Platoon of M Company was in danger of being overrun by a massed enemy assaulting force, Lt. Capodanno left the relative safety of the company command post and ran through an open area raked with fire, directly to the beleaguered platoon. Disregarding the intense enemy small-arms, automatic-weapons, and mortar fire, he moved about the battlefield administering last rites to the dying and giving medical aid to the wounded. When an exploding mortar round inflicted multiple painful wounds to his arms and legs, and severed a portion of his right hand, he steadfastly refused all medical aid. Instead, he directed the corpsmen to help their wounded comrades and, with calm vigor, continued to move about the battlefield as he provided encouragement by voice and example to the valiant Marines. Upon encountering a wounded corpsman in the direct line of fire of an enemy machine gunner positioned approximately 15 yards away, Lt. Capodanno rushed a daring attempt to aid and assist the mortally wounded corpsman. At that instant, only inches from his goal, he was struck down by a burst of machine gun fire. By his heroic conduct on the battlefield, and his inspiring example, Lt. Capodanno upheld the finest traditions of the U.S. Naval Service. He gallantly gave his life in the cause of freedom. USS Capodanno (FF-1093) was named in honor of Lieutenant Capodanno. The Capodanno was commissioned September 17, 1973, and became the first ship in the U.S fleet to receive a Papal Blessing when it was blessed by Pope John Paul II in Naples, Italy, September 4, 1981. On July 30, 1993, it was decommissioned and sold to Turkey. The city of New York declared July 3, 1976, "Father Capodanno Day" and held a Mass, followed by a parade that included the United States Marine Corps Color Guard, bands from the United States Navy and the United States Marine Corps, and Boy and Girl Scouts. Near the south end of Staten Island's Father Capodanno Boulevard, at the corner of Midland Avenue, a monument in the chaplain's honor is made of light gray Barre granite, stands 8' high and 4' wide and has a bronze plaque. Near the north end of the boulevard, alongside Fort Wadsworth's Father Capodanno Memorial Chapel, stands a 1977 statue of the chaplain praying for a fallen soldier. Saint Vincent's Chapel was the Capodanno family's first choice as a memorial. Within four months after his death, almost $4,000 had been raised by organizations such as The American Legion, The Veterans of Foreign Wars, the Knights of Columbus and the Marine Corps League. The chapel was completed in 1993. It was built in the small mountain town of Thiankou with the help of Father Dan Dolan, another Maryknoller and Father Capodanno's former pastor when he was a missionary in Taiwan. Fort Wadsworth statue, Fort Wadsworth (former Army Chaplain School). ^ a b c d e f "Father Capodanno Biography". Archdiocese for the Military. ^ Davis, Ken. "Vincent Capodanno, LT, Navy, Honolulu HI, 04Sep67 25E095 - The Virtual Wall®". www.virtualwall.org. ^ "Vincent R. Capodanno". Claim to Fame: Medal of Honor recipients. Find a Grave. Retrieved August 7, 2006. ^ Bernard Weinraub (September 9, 1967). "Chaplain From S.I. Killed Praying on Battlefield. Catholic Abandoned Cover to Comfort Wounded Marines". New York Times. ^ "Top Medal Awarded To Dead Chaplain". New York Times. Associated Press. January 8, 1969. ^ "Archbishop Broglio Announces Establishment of Capodanno Guild for the Cause for Canonization of Vietnam War Priest Hero" (Press release). Archdiocese for the Military Services, USA. September 5, 2013. Retrieved April 18, 2019. ^ "Opening of the Cause for Beatification" (Press release). Capodanno Guild. October 1, 2013. Retrieved April 18, 2019. ^ "Film on Vietnam War Hero Father Vincent R. Capodanno Named Winner of 2018 Gabriel Award" (Press release). Archdiocese for the Military Services, USA. May 22, 2018. Retrieved April 18, 2019. ^ The Vietnam Veterans Memorial. "Capodanno, Vincent R." Medal of Honor citation. Retrieved November 12, 2007. Naval Historical Center (February 20, 2000). "US People — Capodanno, Vincent R." Online Library. Retrieved August 7, 2006. The Vietnam Veterans Memorial. "Capodanno, Vincent R." The Virtual Wall. Retrieved November 12, 2007. Mode, Daniel L. (2000). THE GRUNT PADRE The Service & Sacrifice of Father Vincent Robert Capodanno VietNam 1966-1967. CMJ Publishers. ISBN 9781891280085. LCCN 99-069490. THE GRUNT PADRE IN VIETNAM "God is with us all this day.". Focus Films. ASIN B002Y16MA0. Glass, Doyle D. (2014). Swift Sword: The Marines of Mike 3/5. Coleche Press. ISBN 978-0692217047. Wikimedia Commons has media related to Vincent Capodanno. "Vincent R. Capodanno". Hall of Valor. Military Times. Retrieved January 24, 2010. Biographical site for Rev. Capodanno. "Capodanno, Vincent R." Mission Capodanno. Retrieved November 12, 2007. This page was last edited on 18 April 2019, at 04:48 (UTC).